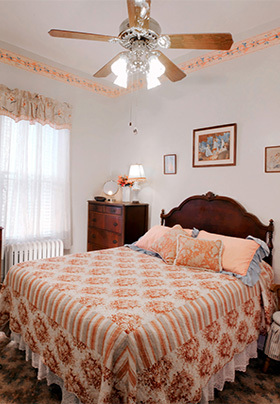 Our Cape May Inn Maria Suite (#2) is a charming six-room Victorian suite located at the rear of the first floor, offering generous accommodations for up to six guests. The suite is tastefully appointed with a mix of antique and contemporary furniture, handmade curtains, drapes and Victorian lampshades. A complete living room with one queen-size sofa bed, flat-screen TV, VCR and DVD, and a cherry gas-log fireplace with remote control. A private dining room with dark maple table, chairs, and corner hutch with seating for six. 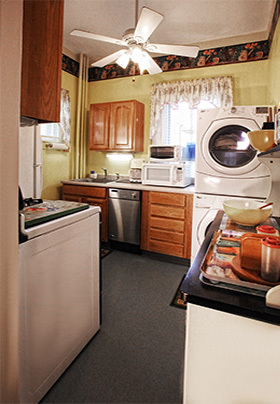 Fully equipped kitchen with gas stove, dishwasher, washer/dryer, microwave, toaster oven, coffee pot, and refrigerator. Master bedroom with queen-size bed and flat-screen TV/DVD/VHS. Small, private second bedroom with a TV, full-size bed and French doors located off the dining room. One modern tiled bathroom with shower, toilet, and sink. Bedrooms and living room have window air conditioning units. Ceiling fans in all bedrooms, living room, dining room, and kitchen. Private entrances from the living room and/or dining room.